The drinks team decided that this concept from the Flickr blog would be a fun way to get to know some local bartenders. So we stole it. We’re passionate about spotlighting D.C.’s finest behind the bar. Our first round is with Katie Nelson from the Columbia Room. 1. Introduce yourself. What’s your current position and how’d you get where you are today? Katie Nelson, Service Manager and Bartender at the Columbia Room, a 10-seat private bar within the Passenger. In a literal sense, I got my current job because I had been a regular at the Gibson, which was my neighborhood bar and, of course, where my boss, Derek Brown, worked for over a year. I was in the right place at the right time when he asked me to take a job working for him, and I’m a lucky lady. Beyond that, though, I come from a family that relishes food and unique experiences. I grew up mostly in North Carolina, but I’d also lived overseas in Saudi Arabia and traveled from a young age, which I reckon helped me to develop a wider palate. After college, I took on a bartending position in a restaurant where I’d worked as a server, and I loved taking care of the customers and making drinks, but I was under the impression at the time that the job wasn’t meant to be a permanent position. I moved to D.C., worked a few different jobs and moved around a bit more before coming back finally to the beverage/hospitality industry. I’d noticed that all of the things I’d liked about all of my previous jobs had in some way to do with aspects of this field, and considered culinary school, but realized that the immediacy of working in a bar — crafting drinks in addition to being able to personally serve and talk to the customers — made bartending a more ideal position for me. My Southern-ness comes out — I really enjoy making people feel happy, so it’s a natural fit. My particular role at the Columbia Room brings my joys to the forefront: constantly experimenting with flavor, learning from the cocktail greats of the past and present, educating my palate and passing on information to others when I can, and helping to create a hospitable experience for our guests. 2. What’s the first drink you remember learning to make (or the first drink you remember drinking)? The first “cocktail” I remember tasting was this daiquiri-like concoction that my grandmother always made when we went to stay with her in Maryland during my family’s summer and holiday visits. Grandma would have the blender set up next to the kitchen sink so that she could easily whip up a batch at a moment’s notice. We called the beverage “strawberry drink,” which basically consisted of strawberries (fresh or frozen, depending on the season), a can of frozen limeade, and ice, pulsed smooth in the blender, with the addition of a slug of light rum for the adults present in the house. I remember, as a child, accidentally picking up my mother’s glass of spiked strawberry drink to take a sip and thinking, why on earth would she want to drink that? Later on, I decided that it was kind of tasty, actually. When I moved to D.C. after college and lived with Grandma for a few months, she’d make strawberry drink for the two of us for a little happy hour at home before dinner. It’s a nice memory. 3. What’s your favorite original or adapted cocktail, or beer or wine (to make and/or serve)? Right now I’m really enjoying light cocktails with base spirits such as aromatized or fortified wines. There’s a tasty recipe I found recently, called the Fancy Sour, that uses sweet vermouth as a base. After testing a few different kinds, I decided that Carpano Antica Formula, an Italian sweet vermouth made using the original style developed in Turin in 1786, is the ideal choice for this particular recipe. Combine an ounce of the Carpano with a half ounce each of fresh lemon juice and maraschino liqueur, add a dash of orange bitters and aromatic bitters, shake with ice and strain into a chilled cocktail glass, then garnish with a healthy strip of orange zest. It’s deliciously tangy, delicately sweet and a touch savory from the maraschino and bitter elements – very good find. 4. Where do you go and what do you order on your night off? I have a few different go-tos: I’ve become hooked on Adam Bernbach’s gin and tonic (using Old Raj gin and housemade tonic) at Estadio — the first time I tried it, I couldn’t stop thinking about it and actually went back the very next day to have another one. When I get the chance, I also make a beeline for the Tabard Inn and sit at the bar when Chantal Tseng is working. She makes wonderful, thoughtful cocktails, and I credit her with turning me on to sherry. Otherwise, my local bar on a night when I don’t feel like venturing too far from home is Room 11 — I always experience great hospitality there and Ben Gilligan’s small bites and Dan Searing’s cocktails are right on. Bonus that it’s only a few blocks from my apartment. 5. If you weren’t doing this job, what would you be doing instead? I’d probably be working overseas teaching English – something I’d done in France before and what I’d planned to pursue again before I was offered the job at the Columbia Room. I have a strong penchant for language, travel and learning about foreign cultures, and teaching English can be a good means to immerse oneself in the midst of a different world. I’m fascinated by the fact that across the globe, there are a multitude of traditions in spirits and wine. There is plenty for me to explore abroad and in the U.S. in the beverage field, and I’m really thrilled about that. 6. One for the road. Help our readers build their home bars by recommending one specific bottle they should add. Pedro Ximenez (a.k.a. PX) sherry is a good choice. PX is rich and concentrated with dried fruit flavors like raisins and dates, and is very sweet — like dessert in a drop — but beautifully acidic, so it doesn’t seem overly cloying. It’s versatile: you can drink it straight, drizzle over vanilla ice cream, or use as an alternate for simple syrup to sweeten certain cocktails. Yum. And the bonus question, whom should we talk to next? 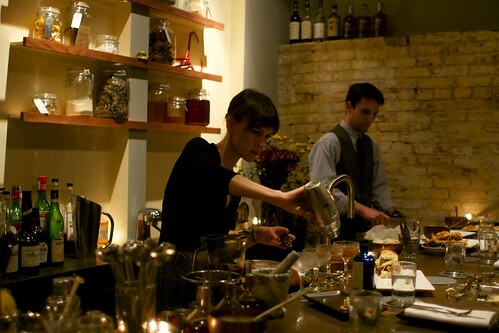 I recommend Alex Bookless, J.P. Fetherston, and Julia Hurst as great bartenders with whom you should become acquainted. Thanks again for allowing me to participate! We would like to thank Katie for participating and starting this feature off with such a bang. Next installment coming soon! Katie took good care of me & my guests at my Columbia Room birthday party. The drinks were delicious, the environment elegant, and our bartender delightful, fun, and knowledgable. http://www.Bars-and-Bartending.com is a complete FREE online guide to becoming a fantastic bartender. Everything for resume building to get your foot in the door, to tips, tricks, and techniques. Games and jokes to entertain patrons, and promo ideas to impress the boss. There’s so much more in the world of bartending, come and find out!